Bait camps all along the Texas Coast thrive on selling baits, particularly live shrimp, that are used when fishing for the Big 3. Conditions have to be right in order to have a good chance of success in catching those popular fish and many anglers find that if the conditions are not favorable, meaning good water clarity and tidal movement, they return home with empty stringers and nothing for the table. During those off days for game fish, fishermen will catch and curse what they call trash fish or undesirables and toss them back in the water. What a mistake if one of the objectives is a good meal. Let’s take a look at some of those fish, where to catch them and some of the pros and cons about them. Two of the best fish for table fare are sand trout or Gulf trout and sheepshead. Anglers use the terms sand trout and Gulf trout interchangeably although they are two different species; however, for eating purposes, there is no difference. Sand trout, on average, are smaller than their cousins speckled trout; however, when dining upon both, hardly anyone can tell the difference. Sand trout have thinner skin which often makes them harder to filet and they do not maintain their fresh taste after freezing as well as specks. For the table, you are missing out on some delicious fish if you ignore them. Sand trout are scattered everywhere in the bays and are easy to catch with both live and dead bait. There is no bag or size limit on sandies. Sheepshead offer some of the finest white meat of any fish; however, they are not as easy to clean as the Big 3. Once an angler masters the art of filleting sheepshead, rarely do they toss them back. 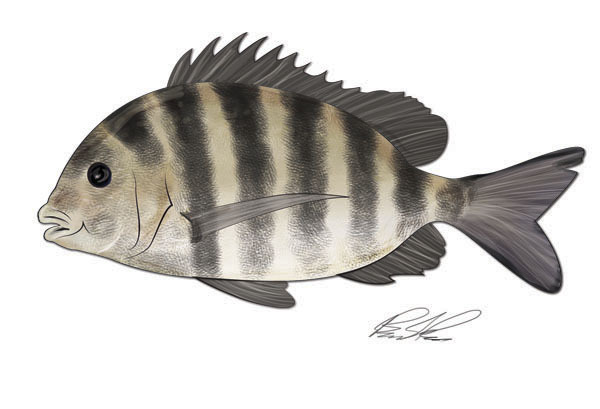 Sheepshead are found around the jetties, piers, pilings and other structure. There is a bag limit of five, with a minimum length of 15 inches. Whiting and croaker are excellent to eat; however, the larger sizes, ¾-pound and greater, are the only ones worthwhile to clean. Both filet well, there are no bag and size limits and the fish are found just about everywhere in saltwater. Black drum are much like sheepshead when it come to cleaning. Puppy drum are best for the table and offer tasty meat. Many anglers shy away from black drum due the presence of parasites (worms) when cleaning. Still, there is some excellent seafood using fresh drum for your recipes. 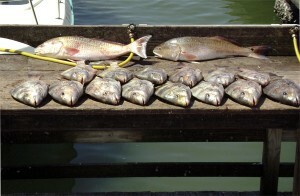 Black drum have a five-fish bag limit and only slot drum between 14 and 30 inches may be retained. The fish is found in just about any location in the Galveston Bay Complex. Gafftop also are fish that anglers find difficult to clean. Large gafftop offer good quantities of meat and, when cooked using one of the popular recipes, they are quite good. There are fishermen who concentrate on gafftop due to the tough fight they offer and the good tablefare afterwards. These fish are found all around the bay complex. Spanish mackerel is another variety of fish that anglers consider questionable when the species is mentioned. Too bad because when cooked fresh, they are excellent. Recipes calling for broiling or baking fish are best for Spanish mackerel. Smacks, as they are called, are prolific fighters when hooked. The fish is in the mackerel family and is oily, which results in their not freezing well. There is a generous 15-fish bag limit and minimum size of 14 inches associated with Spanish mackerel. Anglers focusing on smacks tend to concentrate on clear green water in the surf and around the jetties. During the summer months the fish can be found all around the area when conditions are right. If fishermen would add the fish we discussed to their objectives when fishing, it could reduce the pressure on the Big 3. It certainly would not take away from the quality of your tablefare.